L.O.L. Surprise! 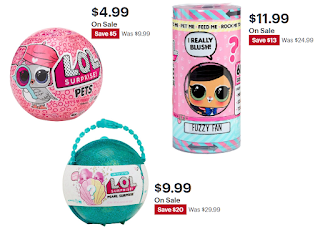 Toys Sale: L.O.L Surprise! Eye Spy Pet Figure $4.99 (Reg $9.99), L.O.L. Surprise! Interactive Live Surprise Pet Blind Box $11.99 (Reg $24.99) + Free Pickup at Best Buy or Free Shipping With $35 Order. They also have the L.O.L. Surprise! Pearl Surprise Doll for $9.99 but that one is for store pickup only and not in stock in many locations. Great prices for gifts!